Time Palette's purpose is to display the current time from various cities around the world on your desktop, but its functionality goes way beyond what you see on the surface. The application is also capable of making various geographical, astronomical and weather-related calculations. It comes with a built-in almanac on sun and moon phases, scheduling and alarm features, a distance calculator, as well as an integrated weather reporting function. When launched, the application will display a small palette, with the current time from three cities. You can set it do display up to 15 clocks, for any city you want. The application allows you to choose from almost 10.000 locations from around the world. All you have to do is type a city's name or part of it and select it. 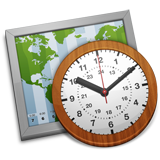 Besides a city's name and its current time, the application can also display the time with seconds, in 12 or 24 hour format, it can show weekdays, time zone names and other details. The small palette is not all the application has to offer. You can bring up a good selection of tools, on a tabbed panel, which you can use to set up schedules and alarms, view the weather conditions for individual cities, preview the moon phases for any location on the globe and more. Time Palette allows you to do anything, from viewing the current time to calculating the moon phase, for each of its supported cities. What's more, the application allows you to add new locations yourself. All you have to do is make a few specifications, like the location's name, region, country and time zone, as well as its latitude and longitude. Time Palette can display the time for any city in the world. It is capable of displaying up to 15 clocks on your desktop. Also, the application comes with a wide range of useful tools. The unregistered version can't display more than three clocks. With Time Palette's rich functionality, you can know much more than the current time in any city in the world. You can download Time Palette free here.